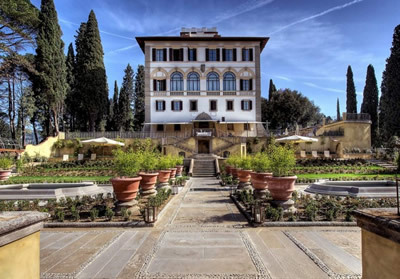 On a hill overlooking Florence is a restored 15th Century villa, surrounded by gardens, with a spa, a swimming pool and as many frescoes as a civilised traveller could wish. Il Salviatino opened as an hotel in 2010. Since 2016 it has been owned by Alessandra Ravati Vitali, the founder and art director of Tearose. 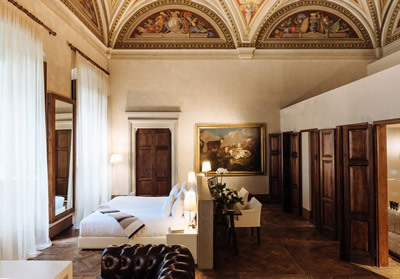 Its 44 rooms are stylish and imbued with the sophisticated taste of modern Italy. Moreover, it enjoys the services of two gentlemen of impressive talent: the genial General Manager, Marco Milocco (whom I first met at the Danieli in Venice, years ago) and his brilliant Executive Chef, Stefano Santo. 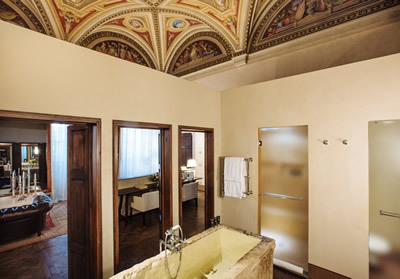 Sadly, I had to turn down the suite which had been reserved for me because my ailing back is no longer up to the challenge of a ‘Roman’ bath. (I have faced this difficulty occasionally in other properties. Such baths, with their flat bottoms and straight sides are splendid for the agile, and wonderful to look at, but they are no good for those of us advancing into decrepitude.) Instead, I settled into room number 35, a ‘Double Deluxe’ on the third floor. This was a high-ceilinged chamber of red and grey, with a wood-block floor, a superbly soft bed and a French window giving onto a Juliet balcony providing a view of the grounds. Lots of books on art and architecture were provided for my mind, and the requirements of hygiene for my body could be met in a bathroom with one wash basin, a stand-alone bath tub, a separate shower, a separate loo and toiletries by Aqua Flor. If the weather is clement, eating can be done on the restaurant terrace, which offers a delightful panorama of the city below. But I fear the weather was not clement for me. Still, this entailed no penance on my part, for the alternative is the Villa’s Library. I loved this chamber. It is lined with books, of course, but its grandeur comes from its large size, its vaulted ceiling and its magnificent carpet. Here I enjoyed the cuisine of Stefano Santo. 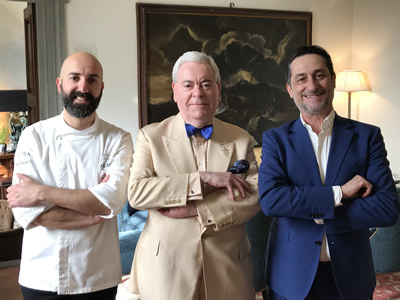 Chef Santo – pictured, with your correspondent and the excellent Maitre d’, Alessandro Frassinelli – is a man of firm opinions and remarkable culinary talent. I admire him for both. Looking at his menu before dinner, I expressed some hesitancy about his use of Asian flavours. These would not, he insisted, be a problem. Nor, indeed, were they, for he uses them with such delicacy and subtlety that they enhance and do not distract from the flavour of the core ingredients of his dishes. This I found at once when my meal began. Scallops, with Asian-flavoured pork belly, celeriac and raspberry, were exquisitely presented on a square white plate. The precisely cooked scallops were set off to magical effect by the other elements of the dish: the combination and balance were joyful. Then from impressive complexity I was taken to the profound joy of simplicity: a whole sea bass, simply grilled and boned by the table. ‘Twas succulence incarnate. I have not enjoyed a fish so much since a lunch at the Gritti Palace in Venice half a decade ago. And then, as at Il Salviatino, I had the perfect partner: Antinori’s great blend of chardonnay and grechetto from Umbria, Cervaro della Sala (here in its 2016 vintage). Such is gastronomic bliss. I concluded this lovely meal – carefully served to me by waiters in suits or red aprons – with some superb chocolate, with a grapefruit reduction and rosemary ice cream. The wine list has 210 offerings, all Italian – apart from the champagnes and Chateau d’Yquem. Prices run from 45€ for a 2014 chianti to 1,800€ for 1998 Quintarelli Alzero Riserva. Other bottles to catch my eye were: Krug Grande Cuvée (410€), 2015 Tignanello (180€), 2013 Solaia (460€) and 2001 Biondi Santi Brunello di Montalcino Riserva (1,000€). The good glassware is by Zafferano. It was back to the Library for the breaking of the fast. It struck me how soothing it was in the morning to be in the presence of books. Having had such good food the previous evening, I expected the breakfast comestibles to be of the highest standard. And they were. From the buffet I secured cereals, fruit, ham and tarts and to my table were brought silver pots of coffee, bacon, scrambled eggs, mushrooms and tomatoes. This was a good way to start my day. 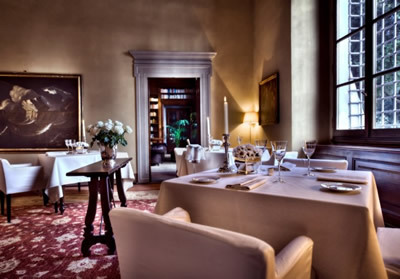 And Il Salviatino is a good place at which to stay if you are looking for a really civilised visit to Florence. It offers comfort, style, good service and the fine cooking of Stefano Santo. Via del Salviatino 21, 50137 Fiesole, Florence, Italy. 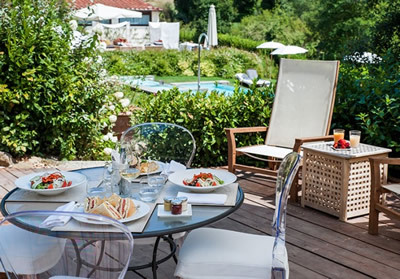 Double rooms from 388€-584€, breakfast included, according to season. 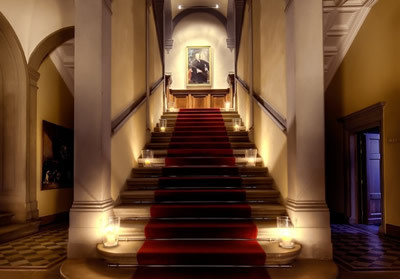 Check the hotel website for the rates for specific dates and for special offers.